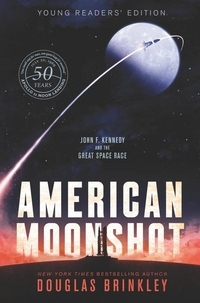 In anticipation of the 50th anniversary of the first moon landing, New York Times bestselling author and historian Douglas Brinkley delivers a young readers' edition of a story rooted in heroism, bravery, and patriotism: America's race to the moon. July 20, 1969. It's a day that has earned a spot in history. It's the day that America was the first nation to succeed in sending two astronauts--Buzz Aldrin and Neil Armstrong--to the moon. But what led to this unforgettable event? What were the stakes riding on the Apollo 11's safe landing? In acclaimed author Douglas Brinkley's first young readers' edition, space fans will get the riveting and factual backstory of arguably the most significant achievement of the 20th century.